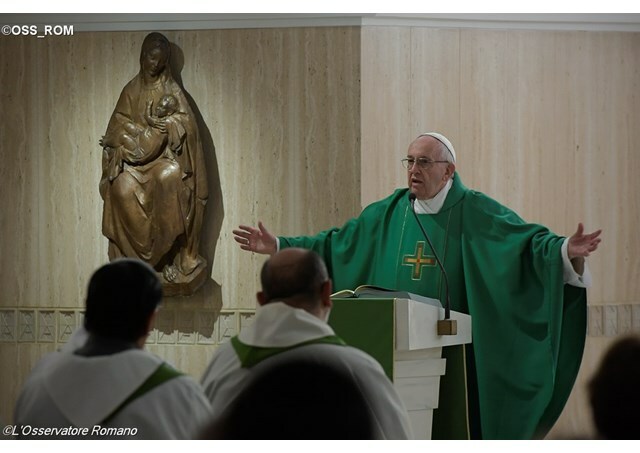 In his homily at Mass in the Santa Marta residence, Pope Francis reflects on the exploitation of women today who are treated like objects, recalling that without women men cannot be the image and likeness of God. Taking his inspiration from the gospel reading from Matthew where Christ said that everyone who looks at a woman with lust has already committed adultery, Pope Francis’ homily was a reflection on the many different ways in which women are exploited in today’s society. He lamented how so many females are used and cast aside and spoke of the young women who are forced to sell their own dignity in order to earn a living. Reflecting in particular on the gospel words about men desiring women, Pope Francis lamented how we see women treated as objects of desire in the media and those same images of women are often used to sell a product and we see her “humiliated” or “wearing no clothes.” The Pope went on to point out how this exploitation of women is not happening in far off places but right here all around us, where we live and in the workplace. Women are the victims of that “use and throw away mentality” and don't even seem to be treated as “a person,” he said.